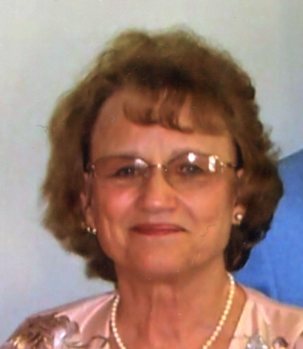 Judith Arlen Ingram, 79, of Kokomo, went home to be with the Lord at 12:15 p.m. Sunday, April 14th at the Wellington in Kokomo. She was born April 6, 1940 to Charles F. and Daisy L. (Glassburn) Skidmore. She married Horace G. Ingram of Nauvoo, Alabama on July 4, 1958 at the Mt. Zion Newlight Christian Church by the Rev. Howard C. Smith. Judy graduated from Clay Township School in Bunker Hill on May 22, 1958 and later attended Kokomo Business College. She worked as a physician’s assistant for over 20 years for Dr. Fondak in Kokomo. Judy enjoyed music and was very talented playing piano and organ. She sang with the Gospelite Trio and Quartet for many years. She served as a Sunday school teacher and youth leader in her church where she was faithful for over 73 years. Judy and Horace enjoyed traveling the United States as much as possible. Surviving family include her husband, Horace Ingram of Kokomo; her two sons, Brent and wife Kathy (Snyder) Ingram of Peru and Kelly and wife Patty (Rethlake) Ingram of Bunker Hill. Surviving grandchildren include, Heidi (Joel) Hawkins, Greenwood; Levi (Margo Martin) Ingram, Kokomo; Kayla (Andrew) Johnstone, Nolensville, TN; Caleb (Bekka) Ingram, Rochester, IN; Kristin (Austin) Rooks, Cookeville, TN; and John Brian Miller of Murfreesboro, TN. Surviving great grandchildren include, Cooper Ingram, Avalee, Ethan and Elias Hawkins, Finley Savasta and Owen and Colten Rooks. She is also survived by one sister, Dixie Sanders of Kokomo. Judy is preceded in death by her parents. Funeral services will be held at 11:00 a.m. Saturday, April 20that the First Baptist Church in Galveston, 207 S. Sycamore St. with Pastor Lonnie Ingram officiating. Burial will follow at the Galveston Cemetery. Visitation will be held from 4 – 8 p.m. Friday, April 19that Murray Weaver Funeral Home in Galveston and also one hour before service time at the church. There's still time to send flowers to the Visitation at the Murray-Weaver Funeral Home from 4:00 PM to 8:00 PM on April 19, 2019.